National Geographic Children's Books, 9781426333149, 26pp. National Geographic spins off its best-selling Little Kids First Big Book series into engaging new board books to introduce even the littlest kids to high-quality nonfiction. These sturdy pages explore the basics of the solar system with amazing photographs, super-simple facts, and lively, age-appropriate language to keep babies and toddlers--and their grown-ups--fascinated by every colorful page. With stunning photos of the Earth and other planets, this beautiful book introduces the very youngest explorers to the wonders of the space, beginning right here on Earth and expanding into the universe beyond. 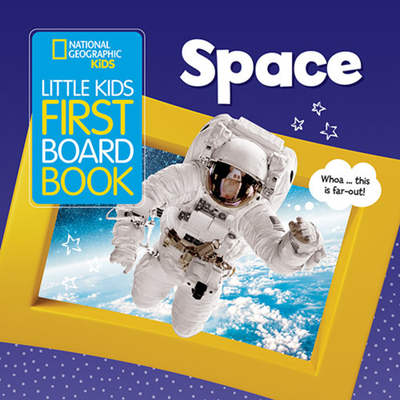 Designed to be the stepping stone to the Little Kids First Big Book series, the National Geographic Little Kids First Board Books take similar subjects and drill them down to the simplest nonfiction concepts for the youngest audience. Not only will readers learn about planets and our solar system, they can also find recurring shapes and patterns in the design; occasional callouts will add humor for adults, and sidebar text offers additional learning for older siblings or those ready for more complex information.With their square shape, bright and playful design, awesome photography, clear text, and cues to encourage interactive learning, the Little Kids First Board Books mirror the beloved First Big Books while taking a fresh new approach to excite a baby's sense of wonder and make learning about nature and science fun. RUTH A. MUSGRAVE, B.S. Education, is an award-winning children's author, animal science expert, and writer for National Geographic Little Kids magazine and the National Geographic Little Kids Look & Learn book series, including Look Up, Peek-a-boo, Big Cats, Look Outside, In My Garden, Birds, Pets, and Let's Make Music. Musgrave shares her fascination with animals with students of all ages by teaching, writing, and developing curriculum.